Creative ads stand out in the competition and get customers interested. Easy to say, but how to come up with one? We’re going to share four creative methods for idea generation that you can use in a group or alone (if you work solo or haven’t built a team yet). Set your goal. Do you want to promote the assortment of products or only one of them? Is it a one-time offer or a long-term promotional campaign? And so on. Prepare a big piece of paper (the larger, the better) and several sharpies of different colors. Visual demonstration is essential to see the big picture of your efforts. Drink a glass of water, air the room, do some exercises to boost the blood flow, and get your head in the game. Now let’s get to the methods. Come up with 100 ad ideas for your product and write them down. The key here is to keep going when you feel there are no more ideas left. Write down everything you come up with, even the most ridiculous ideas. Creativity blows up when you go over all the obvious variants (probably after #30). A tagline (from official to dumb ones). And so on. Try to do it in one sitting, as it’s the only way to come up with the most interesting ideas. Learn more about a list of 100. It is also called thought association. Choose a thing or a phenomenon (your product, for example) and come up with several words associated with it (5-8 is enough, but there can be more). You can use any parts of speech, not only nouns. Say you sell leather backpacks. 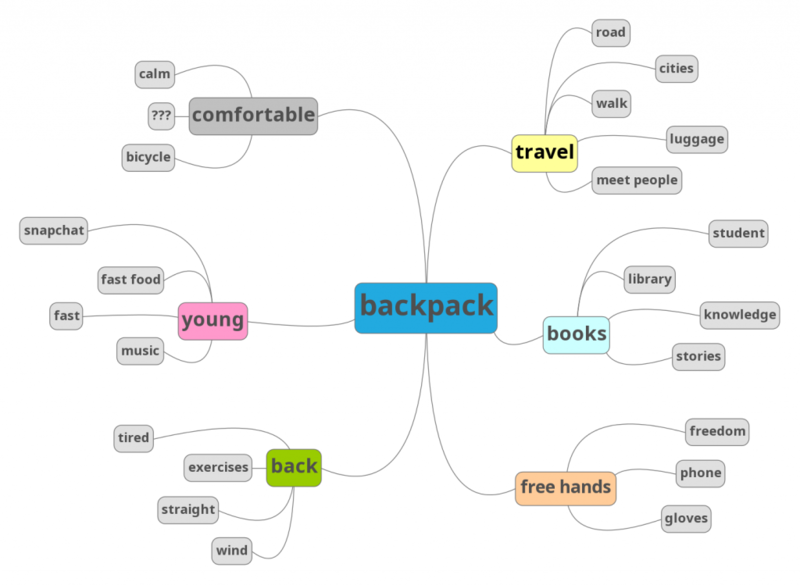 Let’s write down some associations for a word backpack, whatever comes up: travel, a back, free hands, comfortable, books, young. Then write down associations for every word you came up with. Let’s say these ones for travel: a road, cities, walking, luggage, meeting new people, … and so on. Add pictures to make it more clear. You can go for a third round. In the end, you’ll get a tree of associations. A backpack and a city: it’s better to explore the city with a backpack (one of the takeaways: you have to target your ads on social media by interests, e.g. a city, traveling). A bicycle and a backpack: promote the product in groups for bicycle riders. A backpack and free hands: a series of funny photos or videos where people do the same things with a backpack and with a bag in their hands. Combine words from the same and different branches. Again, all ideas matter — even the most ridiculous ones. Get creative first and sort them later. Read more about the mind map method. Usually, it’s teams who use brainstorms: everyone generates ideas, writes them down, and then the team chooses the best ones together. Your imagination is needed here. Imagine you’re a child, a grandpa-fisherman, a guitar player, a businesswoman, a farmer, anyone you like. Just choose different roles. Then find an answer to your question for each of them. What can a child do with a backpack? Or how do you sell that backpack to a businesswoman? The answers to the questions will lead you to fresh promotional ideas. Let the internet help you. Go to any website with pictures — Pinterest, Flickr, or even photo banks. Search for 1-2 words and look through the results. 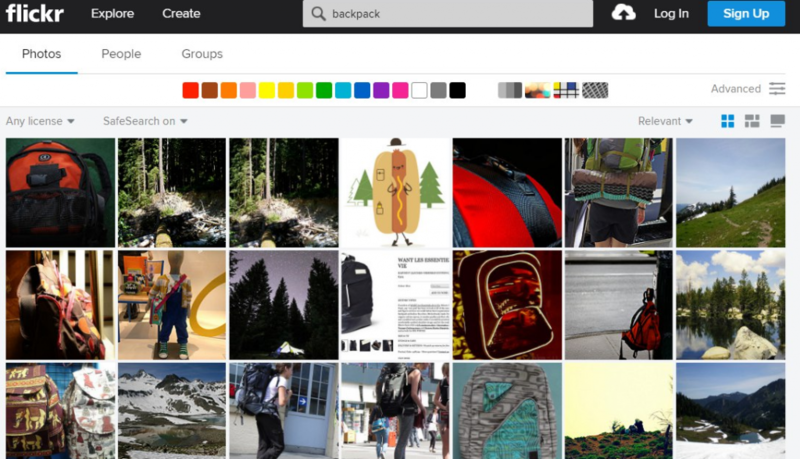 A photo contest or a lookbook that shows how you can combine the backpack with clothes. What’s inside my backpack contest: readers share photos of their backpacks’ contents. Try different search combinations, and use other languages to generate more ideas. Prepare a list of words. Choose any topic (art, reading, a kitchen, a cruise, … anything you like) and put down 15-20 related words in a column. Then mix your product with every word, creating a promotion idea. A chef + a backpack = A chef cooks with a backpack. An idea: with our backpacks, your hands are free to do anything you want. You can go further and show people with backpacks doing different jobs. Kitchenware + a backpack = A backpack guarantees that dishes won’t break even if it falls. So your laptop is always safe. A lunch + a backpack = A couple of lunch boxes always fit in a backpack, so you don’t need extra bags. Those ideas are lying on the surface. You can go through your word list a couple of times and think of something better. After that, come up with a way to use those ideas: shoot a video, run a contest, have a photoshoot, etc. Alternatively, you can write words in two columns, choose a word from each column, and think about how you can use them in your product promotion. That’s when the unique ideas are born! If those methods have just warmed you up, try some more. Decide how to put your concepts into practice. Can you use your idea on different advertising media, or does it work, let’s say, only for a video? Decide on a budget and labor efforts. Everyone wants to feature Cristiano Ronaldo in their ads, but it’s not the only success formula. It’s okay if some ideas drop out here. Test the winners. Ask your friends, colleagues, or maybe even a couple of very loyal customers. Do they laugh, feel motivated, get surprised? A good creative always spurs positive emotions and connects them to your brand in people’s minds. Ask them to rate the ideas from the greatest to the most boring. If it’s still too hard to decide, use these criteria for evaluating creative ideas. If you feel that you came up with a genius one and it will work for sure, trust your gut. No budget? Try to make it easier, cheaper, find free help. A good idea is worth the effort. Make sure to keep the rest of your list of creative ideas for the future.